In the early 1890’s ,Blackpool and Fleetwood were totally different to what they are now. North of Uncle Toms Cabin, the coastal area between Blackpool and Fleetwood was mainly covered in farmland punctuated by what was then the small hamlets of Bispham, Norbreck and Anchorsholme and the small town of Cleveleys. The arrival of the railways around half a century earlier meant that travel was possible between the two towns. However not only was the service infrequent, but also travel between the 2 towns meant a change of trains at Poulton-Le-Fylde. Plans were afoot for a tramroad, similar to that of the Manx Electric Railway, which had been recently built at the time on the Isle of Man to connect Douglas and Ramsey. John Cameron was employed as a consultant and in 1895, walked the proposed route of the new tramway several times and began to make plans for the route. John Cameron would eventually become head of the Blackpool and Fleetwood Tramroad Company. The route, which would begin at Bold Street in Fleetwood, would travel through Fleetwood Town Centre along West Street (now Lord Street), passing Broadwater, Rossall School, Cleveleys, Anchorsholme, Little Bispham, Norbreck, Bispham and Uncle Toms Cabin. When the route reached The Gynn (now Gynn Square), the route then followed Dickson Road and terminating at Talbot Road near to North Station. Construction of the new tramway began on 19th July 1897 at the Fleetwood end of the line and moved at a quick pace towards Blackpool. Cuttings were dug at Bispham and Cabin for the tramway and on what is now Red Bank Road in Bispham for the new depot. Three depots were built on the tramway, one at Bold Street in Fleetwood, this would be used to house the first and last 2 cars from Fleetwood, another at Copse Road in Fleetwood, which would store the open sided trams during the winter and be used as a Permanent Way Depot. Copse Road also had a connection to the main railway line into Fleetwood and although closed in 1963, survived as part of a car dealership until it was demolished in 2015. The other depot was, Bispham Depot, on Red Bank Road, this was to be the main depot for the running fleet and for maintenance. Bispham Depot had its own power station to generate the electricity required to run the trams. Originally, the plan was for the tramroad to continue along the front at the Gynn, heading along what is now the north Promenade towards the Corporation tramway at Cocker Street. However Blackpool Corporation had ambitions of extending their tramway to Gynn Square and the Blackpool and Fleetwood Tramroad was diverted inland along Dickson Road instead. Right from the start, the tramroad was operated by electricity and most of the line was double track except for the Dickson Road stretch, which was single line with passing places. At both ends of the line, double crossovers were supplied to allow for trailer operation. Station buildings were built at key locations on the line, including at Bispham, Norbreck, Cleveleys and Rossall. On 16th April 1898, some members of the local council in Fleetwood were taken on a trial run along the tramroad, hauled by a steam loco and the journey being made in open wagons. For the opening of the Tramway, 10 crossbench rack trams (numbered 1-10) were delivered, along with 3 crossbench trailers (numbered 11-13). As the trams were open sided, they were really only suitable for summer use. Six enclosed Box trams (numbered 14-19), which had heating installed and were and suitable for all year round use, were delivered during the Autumn of 1898 with a further 5 (numbered 20-24) arriving during early 1899. The tramroad officially opened on July 14th 1898, with crossbench 4 being the first tram from Fleetwood – Gynn Square. Such was the volume of passengers wanting to experience the new tramway that the trams were packed full and the timetable had to be abandoned so they could try and deal with the demand. Trailer operation was tried out during the early days of the tramroad, however this was was soon abandoned following a couple of accidents at the termini. The length of time taken to run round and the inflexibility of the operation were also reasons for abandoning the trailers. The trailers were stored for a time, before having their underframes lengthened and being converted to motor trams. The line between Gynn Square and Talbot Road opened after the rest of the route as the streets needed widening to allow vehicles to pass the trams. After the opening of the tramroad, added advantages were soon seen in Blackpool and Fleetwood as well as the other towns and villages in it's path, as they began to grow. Before long, all the farm land that once existed from Cabin up to Cleveleys had disappeared to be replaced by housing, hotels and shops. By Easter 1899, an additional 3 crossbench cars numbered 25 - 27 and 7 composite trams, known as Yanks, and numbered 28-34, built by United Electric Company in Preston. There was no further additions to the fleet until 1910, when a further 3 Vanguards, built by UEC in Preston and numbered 35-37 joined the fleet. Four years later, the final cars to join the Blackpool and Fleetwood Tramroad fleet were 4 Box Cars numbered 38-41, which arrived in 1914. 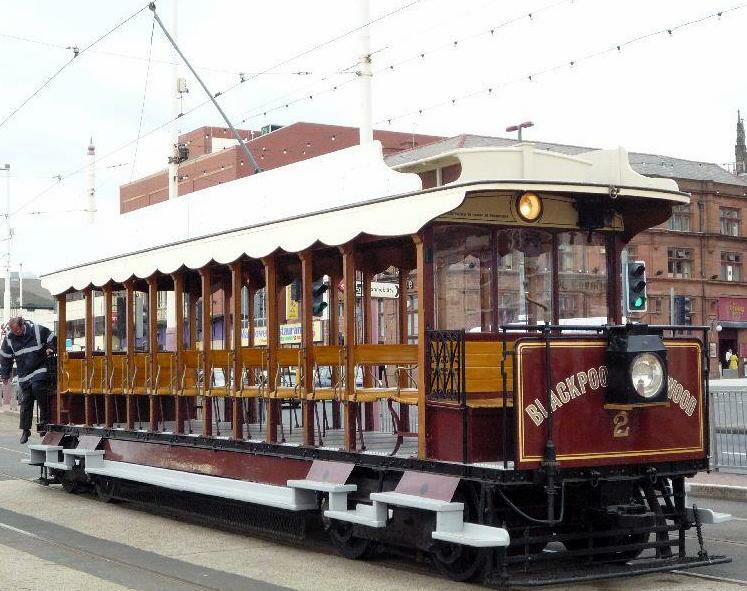 Following the expiry of the 21 year lease of the Blackpool portion of the track, Blackpool Corporation bought out the Tramroad company, with the Tramroad becoming part of the Corporation tramway network. 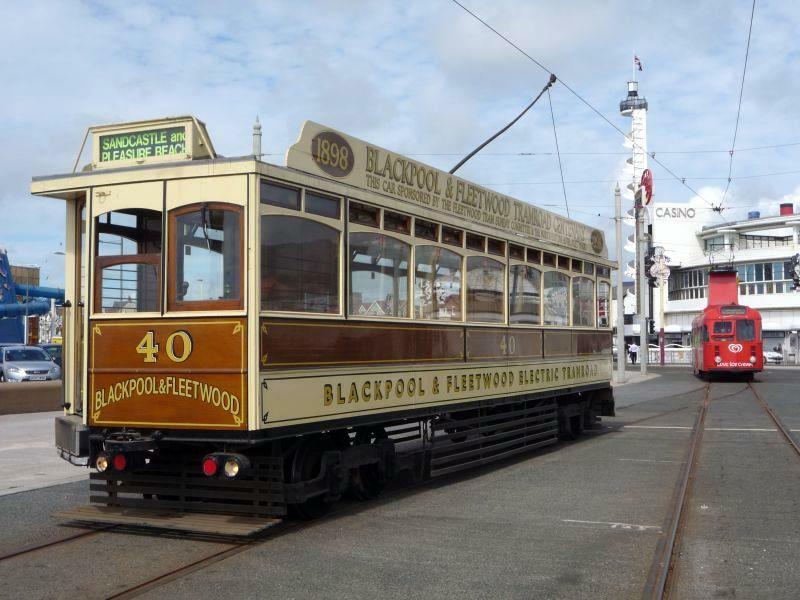 All 41 trams that made up the fleet were transferred to Blackpool Corporation and initially continued to run between on the North Station - Fleetwood line, before finding use elsewhere on the system in later years. Rack 2 and Box Car 40 survived scrapping after a spell as works cars and are preserved with Rack 2 based at Crich Tramway Museum and 40 as part of the Heritage Fleet in Blackpool.